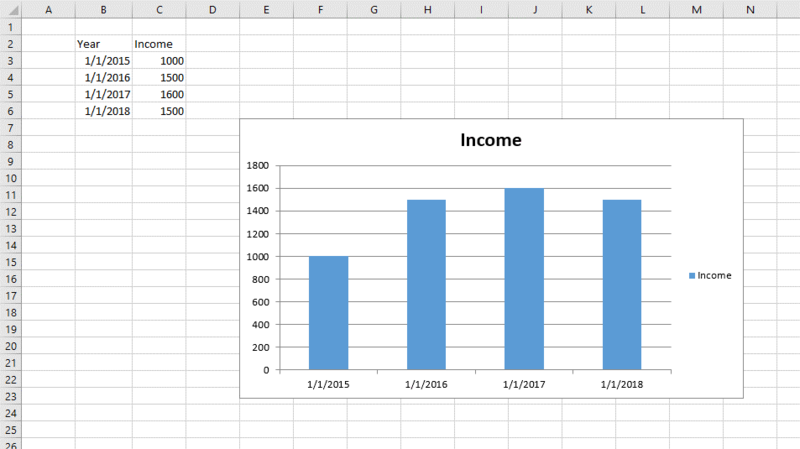 RadSpreadProcessing allows you to add and manipulate charts in your spreadsheet document. This article describes the available API for inserting and modifying different types of charts. The chart objects are preserved in the Shapes collection of the worksheet and are represented by the FloatingChartShape class. The FloatingChartShape object exposes a property called Chart, which is of type DocumentChart. The charts are wrapped in shapes. The FloatingChartShape class derives from FloatingShapeBase and represents the link between the two object or, in other words, is the wrapper allowing you to add chart to a document. The FloatingChartShape class exposes the following constructors, which parse the data in the chartDataRange parameter and create a chart with all data already filled. worksheet: The worksheet that the shape is associated with. cellIndex: The cell index where the top left corner of the shape is positioned. chartDataRange: The range containing the chart data. 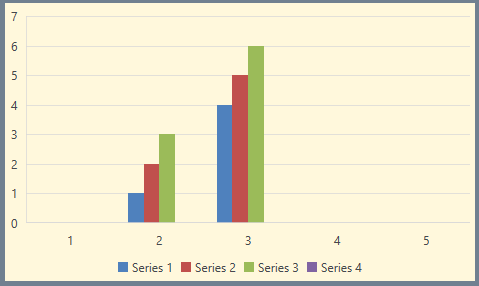 seriesRangesOrientation: A value indicating whether the series of the chart will refer to vertical or horizontal ranges or the direction will be determined automatically. chartTypes: The types of chart that will be created. Passing more than one type will create a combo chart. Once you have created a FloatingChartShape, you can insert it in the document through the Add() method of worksheet's Shapes property. Make sure that you have set the size of the FloatingChartShape object. Otherwise, it will be inserted in the worksheet with zero size and will be invisible. The result of executing the code in Example 1 would look like in Figure 1. The Chart property of FloatingChartShape holds an object of type DocumentChart. The FloatingChartShape class exposes properties allowing you to customize how the shape looks like. You can control the outline of the shape as well as its fill. The result of executing the code in Example 2 over a cell range containing sample data would look like in Figure 2. SeriesGroup: Represents a collection of the groups in which the series of the chart are organized. PrimaryAxes: Represents the primary group of axes of the chart. SecondaryAxes: Represents the secondary group of axes of the chart. It is used when there is more than one group of series (combo chart). Title: Represents the title of the chart. Legend: Represents the legend of the chart. Also, a Clone() method is exposed, which creates a deep copy of the object. You can create a simple DocumentChart object, which is empty and then set the desired values manually. The chart can then be used to replace the chart in an existing FloatingChartShape. For more on Series, the Series help topic. Refer to Working with Axes for description of the axes objects of the chart. The initial data and the resulting chart are shown in Figure 1. The ShapeCollection (Shapes property of Worksheet) exposes two overloads which can add a chart to a worksheet. Internally, they use the same logic as the FloatingChartShape constructor. They create a FloatingChartShape object using the data passed as a parameter and return the object as a result from the execution. You can access the Charts collection of the Shape collection of the Worksheet instance and enumerate the Charts.